Size: 20.3 x 23.4 inches. Condition: In good original condition. Some uneven age-toning. A short repaired tear to the left blank area. Folds as issued. 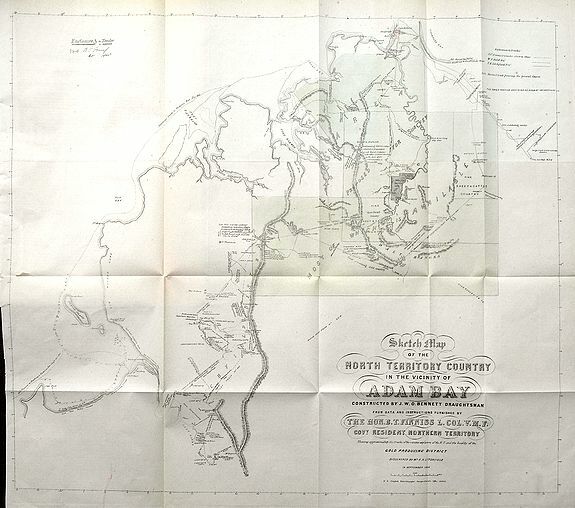 Rare large map extending from Daly River to Adelaide River and Adam Bay. Includes the tracks of the explorers: Finniss, W.P. Auld, F.H. Litchfield. Also shows the routs of the "Beatrice". With many notes on topography, development possibilities and vegetation. Also one location labeled "good promising gold country"! Comes with 8 pages of text (Tenders for survey in northern territory) and a further folding "Plan shewing the proposed system of surveying sections". 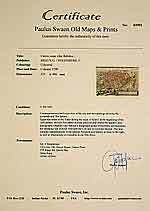 An important and scarce item!